Today on the Harrisburg State Capitol Rotunda steps, the Commonwealth of Pennsylvania recognized November as Small Business Month in Pennsylvania with a focus on #ShopSmallPA during a special event and press conference celebrating the power of small business in the economy. November is Small Business Month in Pennsylvania. I’m honored to stand with some of the hardest working men and women I know. And when Pennsylvania shines a brighter light on their products and services, champions their growth, and advances their economic prosperity, entire communities win. “Underscoring the value of Small Business Month to the region’s economic vitality, I’m pleased to announce that we are redoubling our efforts at Swatara Plaza at The Concourse in Dauphin County to bring 4,100 jobs to the region—and that means more opportunities for enterprise for hundreds of small business owners,” says Richard E. Jordan II, CEO of Smith Land & Improvement Corporation. State Representatives Sheryl Delozier (88th Legislative District), Senator-elect Mike Regan (31st Senatorial District), Deputy Secretary Pennsylvania Department of Community and Economic Development Sheri Collins, Smith Land & Improvement Corporation CEO Richard E. Jordan II and COO Richard E. Jordan III, Harrisburg SBA Solomon Wheeler, lawmakers, Harrisburg Regional Chamber/CREDC and West Shore Chamber members, the National Federation of Independent Business (NFIB), and others joined business owners to celebrate the nearly 1 million small businesses in Pennsylvania. 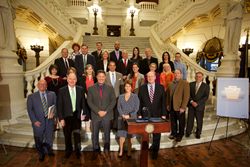 Governor Tom Wolf offered a Proclamation recognizing November as Small Business Month in Pennsylvania. In it he applauded the importance of Pennsylvania’s small businesses to the fabric of the Keystone State’s economy, celebrating their limitless innovation, bold ideas, and contagious spirit of entrepreneurship. Earlier in November, the Pennsylvania House of Representatives passed a House Resolution recognizing the month as Small Business Month and #ShopSmallPA in Pennsylvania, praising the big ideas, risks, and hard work of small business, from storefront shops that line Main Street to the high-tech start-ups that keep our Commonwealth and our nation on the cutting edge. 4. Small business represents 99.7% of all employer firms in U.S.
6. When you Shop Small in Pennsylvania (#ShopSmallPA), you champion the entrepreneurs, innovators, and job creators in our communities. “This Small Business Month in Pennsylvania, Small Business Saturday, and #ShopSmallPA event shines a powerful light on the hardworking entrepreneurs and job creators in the Keystone State. They are the backbone of our community and our economy,” says Sheri Collins, Deputy Secretary, Office of Technology and Innovation, Department of Community and Economic Development. Founded in 1961, the company has a 55-year history of responsible and responsive commercial real estate development and land ownership. With a portfolio of nearly 50 properties and over 1 million SF throughout the Mid-Atlantic, the Smith Land team has chosen to concentrate 80 percent of its real estate investments in their own “front yard” of central Pennsylvania. “We do not outsource our eyes,” says Richard E. Jordan II, CEO. When Smith Land & Improvement Corporation is the developer, business builders and investors can expect a productive working relationship, high-caliber site selection, and easy access to business expansion.